Many people commented that Aquaman is not human, he is Atlantean, and thus is not bound by human limitations. This is wrong on at least two counts. First, in most iterations, Aquaman is half-human, which means that Atlanteans must be similar enough to humans, both physiologically and evolutionarily, to produce a viable hybrid. While there may be some minor differences between us and the children of Atlantis, functionally speaking, we’re the same. Second, these are not issues that plague only humans. Whales get the bends, amphibians freeze to death, fish need to regulate their internal osmolality. These are the problems inherent in being alive in the ocean, Atlantean or otherwise. There’s no way around it. Even with the huge amounts of heat Aquaman would produce as he burned through his daily 48,000 Calories, he is going to get cold. With little body fat and no fur to speak of, his heat retention potential is pitiful. Fortunately, there are plenty of simple solutions to the thermal problem. Unfortunately, almost all of them involve visible changes to his physique. Adding a nice, dense layer of blubber would be the obvious first step (and perhaps promote a superhero archetype that doesn’t resemble the extremes of body dysmorphia). Blubber would be a safe bet for thermal insulation, but, the additional dermal layer needs to be maintained (more mass requires more energy) and the added bulk it would make Aquaman unwieldy on land. Out of the water, sea lions and walruses are not graceful creatures, and our hero spends a fair bit of time among the air breathers. Alternatively, Aquaman could take the otter route, and add a nice, thick layer of fur to protect him from the elements. But there are other solutions in the ocean, so we need not limit ourselves to marine mammals. Tuna are the undisputed kings of the bony fishes, and, you might be surprised to learn, are effectively warm-blooded. Tuna achieve this through a circulatory system that relies on countercurrent heat exchange. Arteries and veins run in tandem. Blood in the extremities and near the surface of the skin are cooled by seawater, but, as the cold blood runs back into the fish’s core, heat from the still-warm vessels on its way to the surface is transferred to the colder blood vessels. In this way, heat is retained close to the tuna’s core. This process may give Aquaman the cold shoulder, but it could maintain body heat around his critical organs. Aquaman has another feature in common with tuna, they both burn plenty of calories to function. A countercurrent heat exchange would allow Aquaman to retain all that extra heat he produces, fortifying him against the chilling cold of the deepest trenches. Perhaps the best solution for our hapless hero is a combination of all three: a thin layer of blubber, a soft coat of downy fur, and an array of countercurrent heat exchangers throughout his circulatory system. In addition to the cold, Aquaman must overcome the changes in osmotic pressure which I earlier argued would cause his cells to shrivel like beef jerky as they try to equalize against seawater. This would eventually cause our hero’s brain to shut down, as he could no longer maintain the pressure gradients necessary to keep sodium or potassium ions flowing. To solve this problem, we must posit an evolutionary solution unique to Atlantean physiology: osmosomes and osmolases. Remember that the problem with osmotic pressure is that if molecules on one side of a semi-permeable cell membrane are more concentrated than molecules on the other side, the cell will try to reach equilibrium by either increasing the concentration of molecules through active transport, or decreasing the volume of water in the cell through the more efficient passive transport. An osmosome/osmolase complex could provide a third option for maintaining equilibrium. The osmosome is a fictional organelle that can rapidly produce small molecules. Just producing molecules is not enough, because scale matters. The osmotic balance of large particles is called colloidal osmolality, and is relatively easy to maintain. This is the osmotic pressure exerted by proteins, DNA’s, RNA’s, and other large cellular molecules. The osmotic pressure of small particles, such as ions, is simply called osmolality, and is much more difficult to regulate. So how do we get from large molecules produced by the (fictional) osmosome, to small particles necessary to achieve equilibrium? We have to break them down, and to do that, we need the (fictional) osmolase. This new Justice League of cellular machinery can rapidly achieve equilibrium within Aquaman’s cells, saving him from a desiccation. Unfortunately, I’m a marine ecologist, so I must leave it to the biochemists among us to hypothesize exactly how an osmosome/osmolase complex would work. Decompression sickness is a nasty, and sometimes fatal condition. It occurs when compressed gas enters your blood stream. Under pressure it remains in solution, like a bottle of carbonated water before you break the seal. Once that pressure is relieved, gas bubbles come out of solution and expand, blocking blood vessels and damaging tissue. In mild cases, decompression sickness (the bends) can cause fatigue, soreness, itchiness, and headaches. In extreme cases, decompression sickness can cause deep tissue pain, incontinence, lower limb paralysis, and seizures, among other symptoms. If left untreated, the bends can kill you. While decompression sickness is commonly associated with SCUBA divers, who breath compressed air at depth and are thus more prone to becoming bent following a too-fast ascent or prolonged bottom time, free divers can also suffer from decompression sickness. Even deep diving marine mammals, such as leopard seals, sea lions, and sperm whales experience decompression sickness. So how can Aquaman avoid the bends while living almost entirely underwater? He needs a mechanism to remove that gas from his blood before it can go into solution. Fortunately, his aquatic kin already evolved such a mechanism, the swim bladder. Swim bladders are organs that fish use to regulate buoyancy. Evolutionarily, they’re homologous to our lungs and both evolved from primitive air sacs attached to the gut. Although their primary functions are in buoyancy control, maintaining stability, and providing a resonance chamber for communication, they accomplish these tasks by pumping gas out of the blood stream and into a flexible chamber. The swim bladder is an impressive organ. Surrounding the actual bladder is a gas gland. This gas gland releases lactic acid into the blood stream, acidifying the blood and causing it to release oxygen. The oxygen is released into a network of blood vessel called a rete mirabile, a web of intersecting venous and arterial capillaries which allow counter-current exchange of gases. As the gases travel through the rete mirabile, they continuously diffuse from high pressure veinous capillaries to low pressure arterial capillaries, resulting in a counter-current multiplier effect which prevents the gases from leaving the rete mirabile while constantly increasing the pressure. Once the pressure inside the rete mirabile exceeds that within the swim bladder, gases being to diffuse into the swim bladder. With a swim bladder, Aquaman could continuously pump compressed gases out of his circulatory system, offsetting the effect of decompression sickness. Once sequestered in this bladder, a simple pneumatic duct connecting the swim bladder to his digestive system would allow gas to be released back into the environment via the usual route. Our Aquaman may be a little more flatulent than his mystical counterpart, but at least he doesn’t have the bends. There’s simply no way around this one. Aquaman has to slow down. Maybe he’s capable of short burst of speed, but there’s no way he’ll ever be able to clock out at 10,000 feet per second. Even the modest 48,000 Calories a day estimates based on a cruising speed 10 miles per hour are just more than anyone, super or not, can realistically handle. With his new insulation, burning that many calories would overheat the ocean’s champion, frying his internal organs and shutting down his nervous system. There is no practical way for an organism shaped like a human to swim at super speeds. Only comic-book magic can save his super-speed. Aquaman, he gets by with a little help from his friends. Aquaman also refers to a five-pointed spear as a “trident”, so he’ not the most reliable source. From New 52 Aquaman #1 DC Comics. The vast majority of criticism regarding my last Aquaman article revolved around my treatment of his ability to communicate with fish. Explanations ranged from Aquaman being able to turn his marine creature telepathy on and off at will to Aquaman declaring that he doesn’t talk to fish, he commands them. I reject these interpretations. 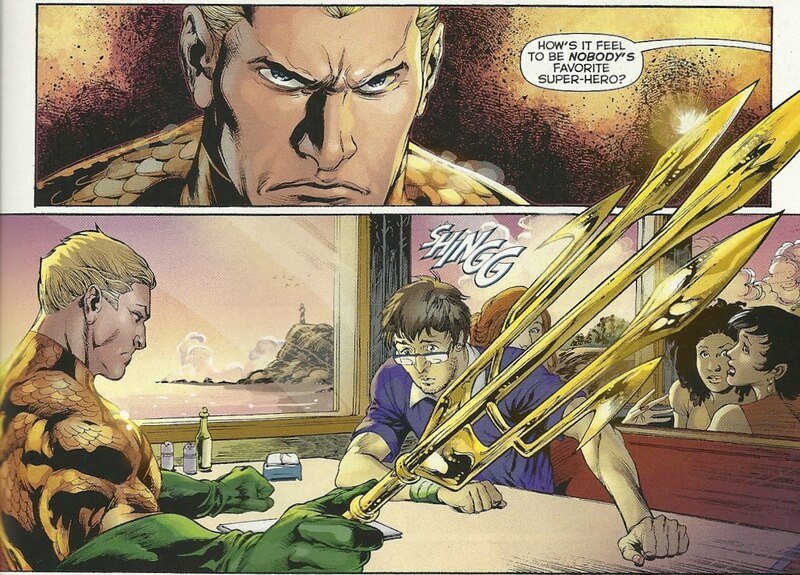 In all iterations of Aquaman from the Golden Age to now (though I confess that I have not read the New 52 Aquaman, which is only 11 issues old and thus has yet to fully explore his powers), Aquaman has been observed not just talking to fish, but responding to various marine creatures’ cries for help. While he may have the ability to shut it off if necessary, it is clear that the default state of Aquaman’s marine telekinesis is “on”. But wait, you say, modern iterations of Aquaman makes the explicit declaration that he doesn’t talk to fish. Aquaman is lying to you, in much the same way an elitist dilettante would lie about chatting up the caterers. Even if Aquaman could turn his fish hearing off, why would he? Aquaman is the champion of the ocean. While the rest of the DC universe is happy protecting its trivial portion of the planet, Aquaman is the sole protector of 98% of the Earth’s biosphere. His ability to use marine life as an underwater internet, broadcasting information from the furthest depths of the abyss, is critical to his success. Aquaman talks to fish and fish talk to Aquaman. Unfortunately, I have it on good authority that sturgeons make lousy therapists. Was Aquaman quietly saving the world during Man of Steel? Thanks, I do indeed rest easier. I have a suggestion. As you note Aquaman basically should have “a thin layer of blubber, a soft coat of downy fur, and an array of countercurrent heat exchangers throughout his circulatory system” – actually if you consider the tensile properties of most superhero outerwear I see no reason not to assume that the blubber and fur are simply sort of girdled into place. That being said you have failed to account thermally for the suit. While modern gortex is no panacea I think tuna would buy in if they could afford it. Not only for the thermal bump but also for the drag reduction, wear resistance (afterall we don’t know how often he replaces the shorts) and telepathic amplification properties (actually I am not sure about the telepathic properties, I checked the gortex web site and did not find any definite mention but you never know what they hide amongst the legal jargon in the fine print). Best of luck from johns pass. PS for the record I figgure that his gortex is a long chain carbon nanofiber weave but I am afraid if I tell they will pull my grant money…..